• Floating vinyl coated foam key tag with chain. • Soft closed cell foam rubber key float is dipped in vinyl and completely sealed and coated with a shiny durable finish. • Key holder will float up to 4 keys. • Perfect for your boat, harbor, marina, or any water sport. 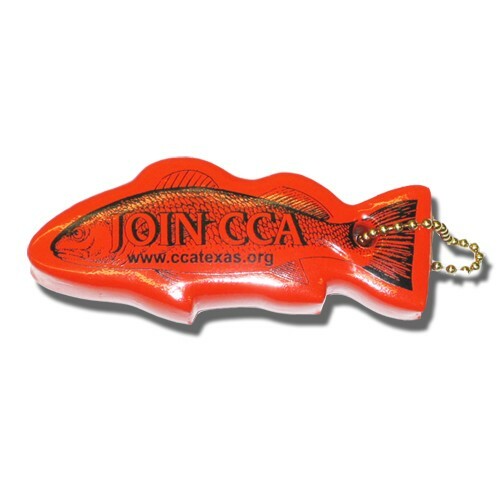 • Key chain measures 3/4" thick, with a large imprint area. • Key float available in 12 different colors with up to 2 side, 2 color imprint. Keyfloat metal ballchains come standard packaged bulk in the same box as the keyfloats. Key chains assembled to keyfloats prior to shipping can leave ball chain dents in the floats. We can assemble keychains to the keyfloats for an additional charge.